Compiled in the UK by organisations such as the RSPB and the British Trust for Ornithology (BTO ), the Red List records birds that are considered critically endangered. Over the last few years the number of birds on the Red List has grown from 40 to 52, including the yellow wagtail, the lapwing and the wood warbler. A recent addition is the cuckoo. The cuckoo arrives here about mid-April (though it can be earlier) and its call is often associated with the onset of Spring. Should you have missed the return of the cuckoo this year, then you can hear it here! Cuckoos lay their eggs in the nests of other birds such as the dunnock and meadow pipit, which then rear all the young that hatch. Their own young are pushed out of the nest by the young cuckoos. 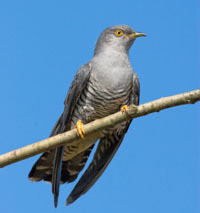 Cuckoos leave the UK in July or August, though the younger birds may leave a bit later. Cuckoos migrate some 5,000 miles from sub-Saharan Africa. They are fairly adaptable, being at home in a variety of habitats from heath, moorland and coastal marsh, though not dense woodland. Despite their adaptability, it has been estimated that now only some 20,000 birds return each year – a massive decline compared to fifteen years ago The reasons for this decline is not fully understood. Suggestions range from changing food supply (they are partial to large hairy caterpillars) either here or in Africa, loss of habitat, climate change etc. For more facts, figures and videos on the cuckoo (and other birds on the Red List), see the British Trust for Ornithology website or the relevant pages at the RSPB.